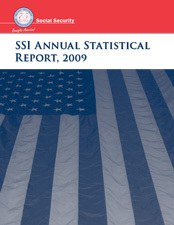 About 7.7 million people received federally administered payments in December 2009. The average monthly payment in December 2009 was $499. Total payments for the year were more than $46 billion, including almost $4 billion in federally administered state supplementation. Despite their disabilities, about 340,000 recipients (5.2 percent) were working in December 2009. Clark D. Pickett managed the preparation of this report. Sherry Barber, Stella Coleman, Art Kahn, Mary Kemp, Judi Papas, and Clark Pickett prepared the statistical tables and narratives. Staff of the Division of Information Resources edited the report and prepared the print and Web versions for publication. Table 78, "Recipients, by selected characteristics and duration of eligibility," is new.